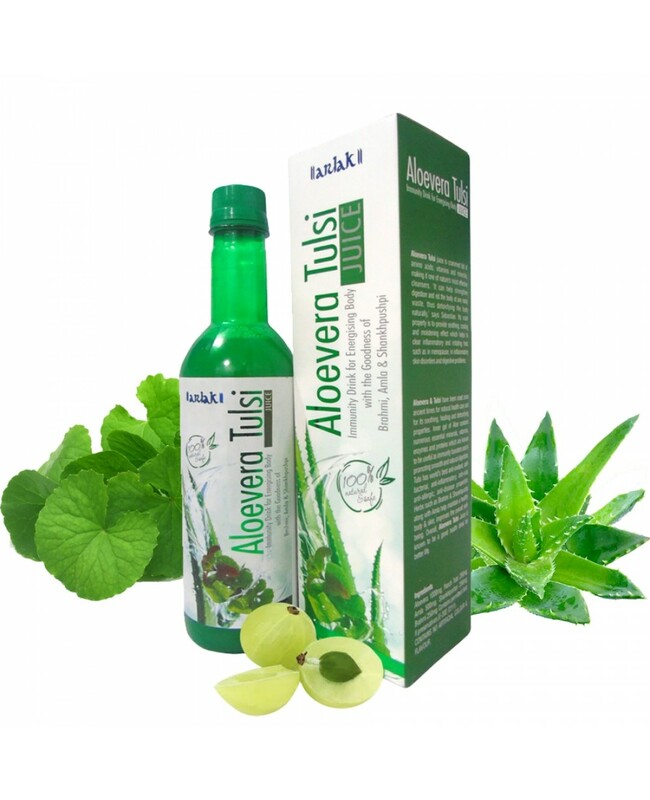 About Arlak Aloevera Tulsi Juice | Aloevera Tulsi Juice is an Immunity drink For Energizing Body with the Goodness of Brahmi, Amla & Shankhpushpi. Aloe vera is a stem less or very short-stemmed plant and its leaves are thick and fleshy, green to grey-green. 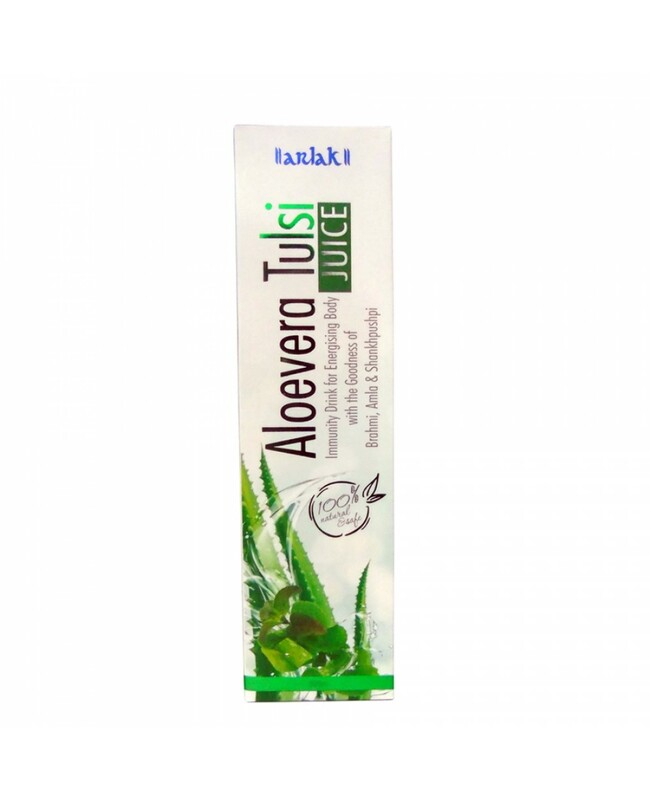 Aloevera & Tulsi have been used since ancient times for natural health care and for its soothing, healing and detoxifying properties. Aloe has two components such as latex and gel. The jelly like substance is found in the inner part of the Aloevera which is used for making medicines. It can help strengthen digestion and rid the body of any nasty waste, thus detoxifying the body naturally. It contains Aloevera, Panch tulsi, Amla, Shankhpuspi and Brahmi. The goodness of Aloevera makes our inner system more alkaline that reduces the bad effects of the acidic stuff we eat. Arlak’s juices are manufactured with cold press technology. Fresh juice is collected and preserved. It is not manufactured by decoction of dry herbs in which the vital contents are usually destroyed. Therefore, Arlak’s juices maintain their natural flavor and efficacy. Aloevera juice helps in reducing acne & blemishes, adds glow to the skin. Aloevera has anti-oxidant properties which help to balance metabolism. Boosts immunity and act as a natural immunomodulator. Normalize blood circulation, blood pressure, promotes digestion, lowers high cholesterol, protects heart & controls diabetes. Beneficial for constipation, skin diseases, infections. Prevents bacterial ailment, including fever, cough and common cold, sore throat etc. Shankhpushpi and Brahmi acts as memory enhancer. Reduces Joint pain & arthritis. Helps maintain a healthy body & a healthy skin, improves the overall well–being. Take 30ml of juice with half a glass of water on an empty stomach. It is more beneficial in the morning. Do not consume anything up to half an hour. 1) Aloevera- Aloevera is rich in antioxidants and vitamins that may help protect your skin and contains nutrients, like vitamins A, C, E, and B12, as well as minerals like potassium, zinc, and magnesium. 2) Panch Tulsi – It is a mixture of 5 tulsi such as Ocimum Sanctum, Ocimum Gratissimum, Ocimum Canum, Ocimum Basillcum and Ocimum Citrioforum for disease free life. These have Anti-Oxidant, Anti-Aging, Anti-Bacterial, Anti-Viral, Anti-Septic, Anti-Flu, Antibiotic, Anti-Inflammatory, Anti-Toxin and Anti-Diseases properties. 3) Amla – It is an excellent source of Vitamin C. Generally pericarp of fruit is used for various herbal formulations. 4) Shankhpushpi – It is an herb which is used in an Ayurveda. It helps in reduce stress, anxiety, tensions, memory loss and sleeplessness. 5) Brahmi - Bacopa monniera and Centella asiatica, are both known as Brahmi. This is used in Ayurveda for ulcers, tumors, inflammation and for enhancing memory.